Pre-engagement rings are, for some, a big step in commitment before engagement is an option. Perhaps the individuals are taking things slow, young, short on cash, or just not quite ready for engagement. A pre-engagement ring can be a beautiful gesture of your intent. They're available in a variety of designs and are generally inexpensive. What Does a Pre-Engagement Ring Mean? A pre-engagement ring means a level of commitment just below engagement. By giving or accepting a pre-engagement ring, you're saying marriage is in the future for you eventually. There's no timeline or wedding (or engagement) date to think about. It's just the understanding that you're both in the relationship for the long haul and could see spending forever together. It's a way for a couple to make sure they're on the same page before a proposal which is especially nice if the proposal is going to be a public one! A pre-engagement ring isn't necessary in this scenario; a conversation would suffice, but it's a nice gesture that some couples prefer. There are several cases where a pre-engagement or promise ring is perfect. High school sweethearts: In most cases, high school students know they're not ready to get married, but they may feel that their boyfriend or girlfriend is the one they want to marry later. A simple, inexpensive ring can symbolize their love, vision for the future, and a commitment. College couples: Getting married in college isn't completely out of the question, but it's not the ideal time for many couples. A pre-engagement ring is a next step for those who aren't financially ready for the engagement ring or wedding but want a visible, romantic symbol of their commitment. Recent graduates: Recent graduates may not be financially ready to pay for the type of engagement ring or wedding they want. Those things may not have to cost a lot, but they easily can and depending on the couple's preferences, a pre-engagement ring could be an inexpensive item to hold the future engagement ring's place as they get started on their careers and begin to save money. Couples who want commitment without marriage: Maybe marriage isn't something that interests either person in a relationship at the moment (though they wouldn't be completely opposed to the idea much later), but commitment is important to them. 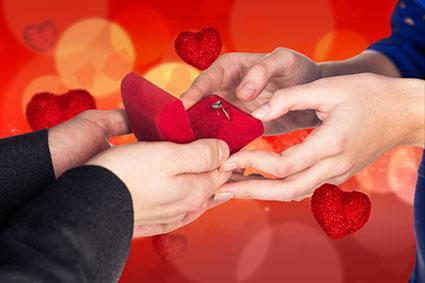 A pre-engagement ring may be the perfect way of symbolizing their committed, monogamous relationship. Pre-engagement rings are essentially the same as promise rings, as both can act as placeholders for the engagement ring to come. What the couple chooses to call the ring is up to them and what the terms "pre-engagement" and "promise" mean to them. They both stand for a serious commitment to each other. You know that you're meant for each other, but engagement and marriage aren't in the cards for you at the moment for one reason or another. If you're not planning to get engaged any time soon, you may wish to call the ring a promise ring. One minor difference between the two types of rings is the finger on which they're worn. Since pre-engagement rings are definitely placeholders, they usually go on the ring finger of the left hand just as an engagement ring eventually will. A promise ring with no intention to be engaged within the next few years can be worn on any finger, but is usually worn on the ring finger of the right hand to avoid confusion. There are many types of pre-engagement rings. Some look like small engagement rings and others look nothing like them at all. If there's ever a case for writing a note or talking to the ring's recipient before handing her a box with a non-engagement ring in it, this is it. Make sure your significant other understands what you're communicating with this ring and that it is not an actual engagement ring. That's probably a good idea no matter which style you go with when you decide to give someone a pre-engagement ring, but it's especially true in this case. 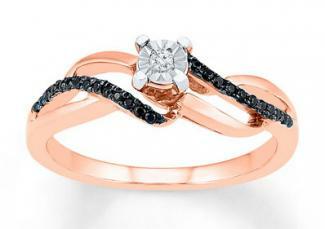 These styles mimic those of traditional engagement rings. They're less expensive, however, making them perfect candidates for pre-engagement offerings. The 1/6 Carat Black/White 10K Rose Gold Ring from Kay Jewelers (about $350) is a fairly trendy selection due to the combination of colors and the presence of rose gold instead of yellow or white, but that may not matter. Even if the woman would prefer a more classic style engagement ring, the pre-engagement ring is generally worn for a much shorter period so it will remain fashionable. The total diamond weight here is 1/6 carat, which includes the white center stone and the smaller black diamonds around it. The Diamond and Pink Promise Ring from Helzberg Diamonds (around $150.00) resembles a three-stone engagement ring. It's made from sterling silver, round diamonds, and pink sapphires. The total carat weight is less than 1/10. Stone colors can be completely up to you and your story as a couple. A birthstone ring is completely appropriate if you want a center stone that isn't a diamond, or choose a stone or color that means something to you both. The June Freshwater Cultured Pearl Birthstone Ring in sterling silver from Helzberg Diamonds (about $100.00) is wonderful for a girl whose birthday is in June, a couple whose anniversary is in June, or just a girl who loves pearls. The pearl in the center is encircled by small white sapphires. The Couple's Double Heart Birthstone and Diamond Accent Ring from Zales, in 10K Yellow or White Gold (around $250.00), allows you to choose any combination of two birthstones and have two names (up to nine characters each) engraved on top. What could be more romantic for symbolizing young love than a ring with diamonds, a heart, and names engraved on it? The Rhythm 1/10 Carat (total weight) Heart Ring from Kay Jewelers (just under $200.00) allows you to personalize your gift with your names on the band. The diamond-studded heart features a lager diamond in the center. The 1/15 Carat (total weight) Black and White Diamond Promise Ring from Jared (just over $150.00) has two interlocking hearts decorated in small round diamonds (one heart is done in white diamonds, the other in black). You can also personalize the ring with names. 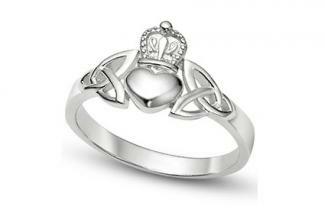 The Claddagh design itself represents love, friendship, and loyalty, so it makes perfect sense to use it as a pre-engagement ring. 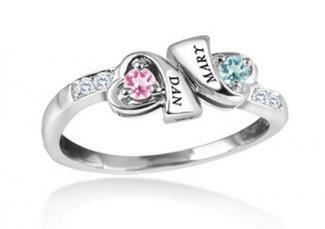 The Personalize Your Stone Color Claddagh Ring from Jared (starting at about $80.00, with prices extending to about $600.00) allows you to choose between birthstones for each month, smoky quartz, or lab-created pink sapphire. Metal choices include sterling silver, 10K and 14K yellow gold, 10K and 14K white gold, and 10K and 14K rose gold. Prices vary based on metal and stone choices. The Diamond Accent Claddagh Promise Ring in 10K White Gold from Zales is about $200.00 and features pave diamonds in the center, covering the heart and crown. Choose a ring in a style that you think the recipient will love and consider one that holds special meaning for your relationship. 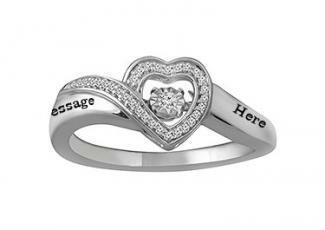 The special meaning could be an engraving of names or a short promise along the band, a stone color, or even a shape. Shop around a bit before committing to a ring, just as you would for an engagement ring. Compare prices, stone sizes, and quality of the metal until you find the perfect one.